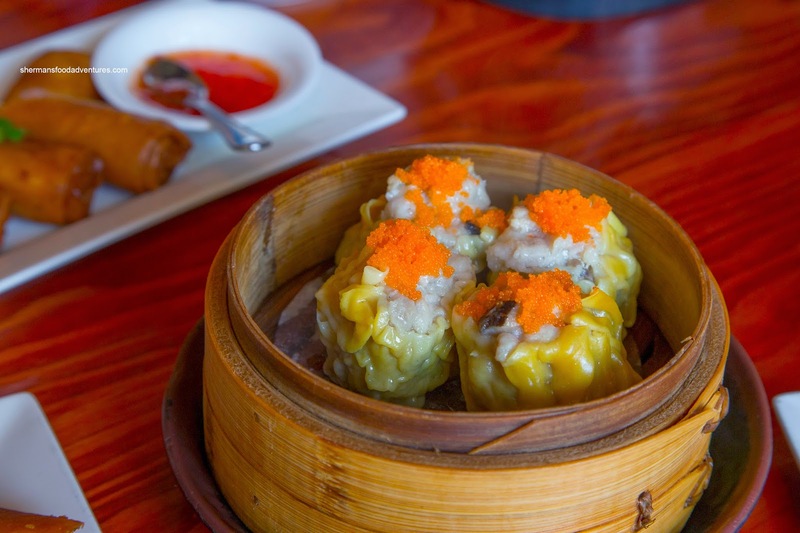 Normally, when one is in LA and yearning for Dim Sum (yes, we were yearning), the best place to go would be Monterey Park. Since we were pressed for time, moving from our hotel in Cypress over to El Sugundo, we weren't really in the vicinity. The solution? 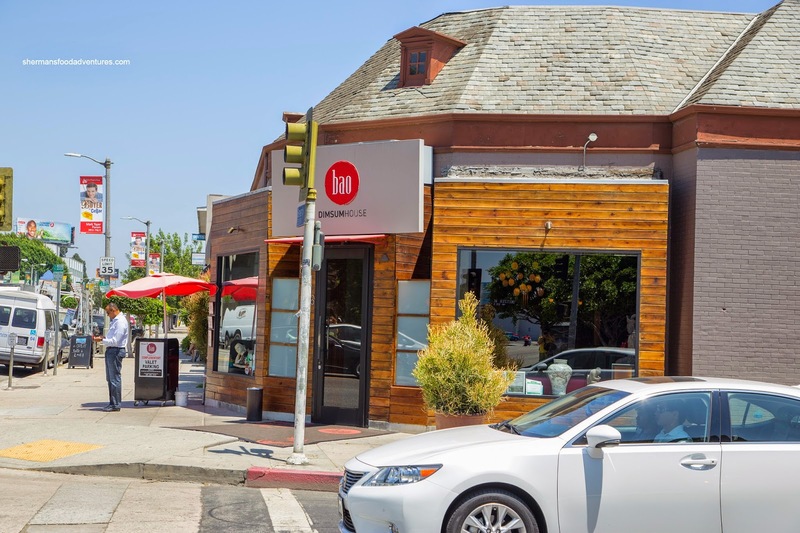 Drive all the way up to West Hollywood and try out Bao Dim Sum House. 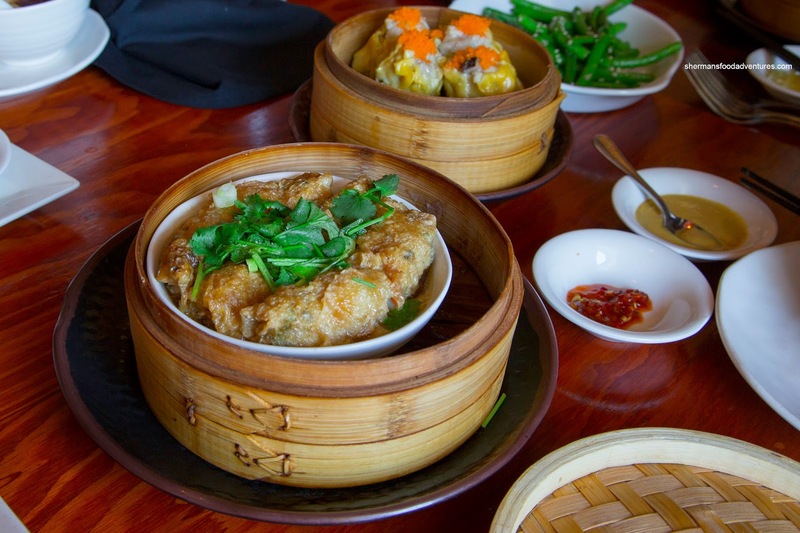 In reality, that wasn't really that close either, but at least we had Dim Sum. Since Costanza was under-the-weather, we were only down to 3 adults, but that didn't prevent us from ordering lots! 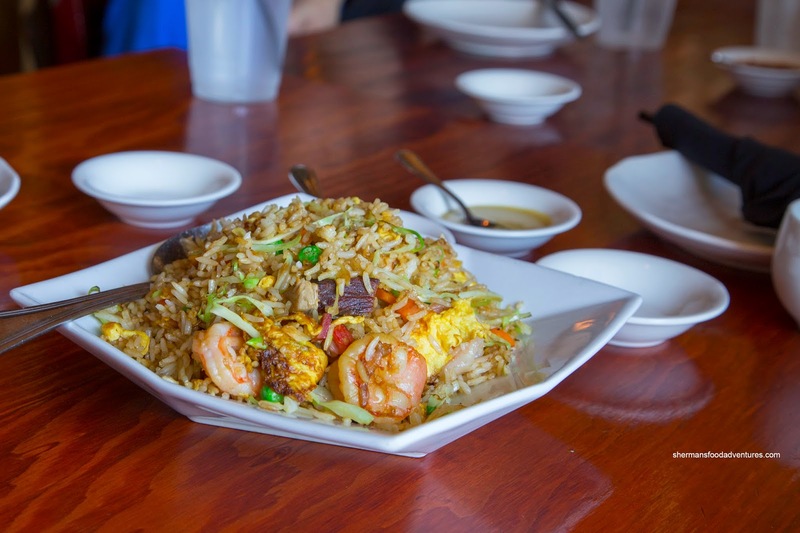 The first dish to hit the table was the House Fried Rice with BBQ pork, egg, lettuce, peas, carrots and large shrimp. Nutty and chewy with a caramelized smokiness, the dish was definitely hit with enough wok heat. The other components exhibited the right textures including the crunch from the carrots, pop from the peas and snap from the shrimp. There was adequate seasoning as well with a good amount of soy. 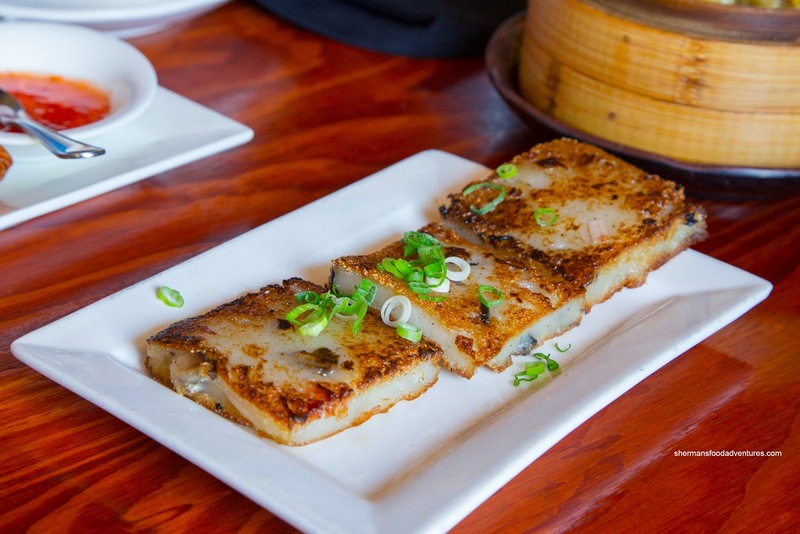 Next up, we had the Pan Fried Radish Cake with Chinese sausage. With a sufficient sear on both sides, there was a slight crispiness as well as smokiness. The cake itself was soft and sweet with a good amount of natural daikon flavour. There could've been more sausage which would added some more balance. -wise, these looked legit and aesthetically-pleasing from the ample tobiko on top. Texturally, these were meaty and chewy (while not fatty), rather than having a rebound texture. There was a natural pork flavor which was accented nicely by the shiitake mushrooms and meaty shrimp. 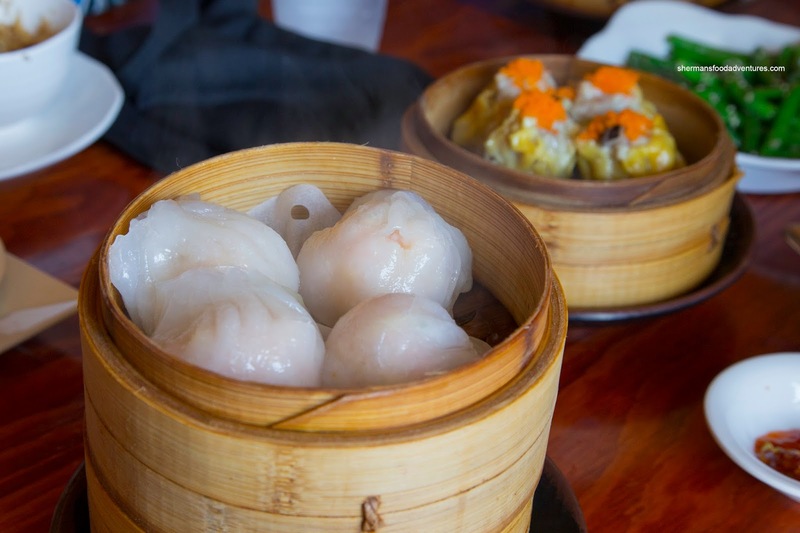 As for the Haw Gow (Shrimp Dumplings), they were large and featured a fairly thick dumpling skin. Inside, the whole pieces of shrimp exhibited a buttery moist snap. They were mildly seasoned where we could get some sweetness and the faint hint of bamboo shoots. So far on our trip, the sight of something green has been a rarity, so we decided to get the Sautéed Green Beans with Garlic. 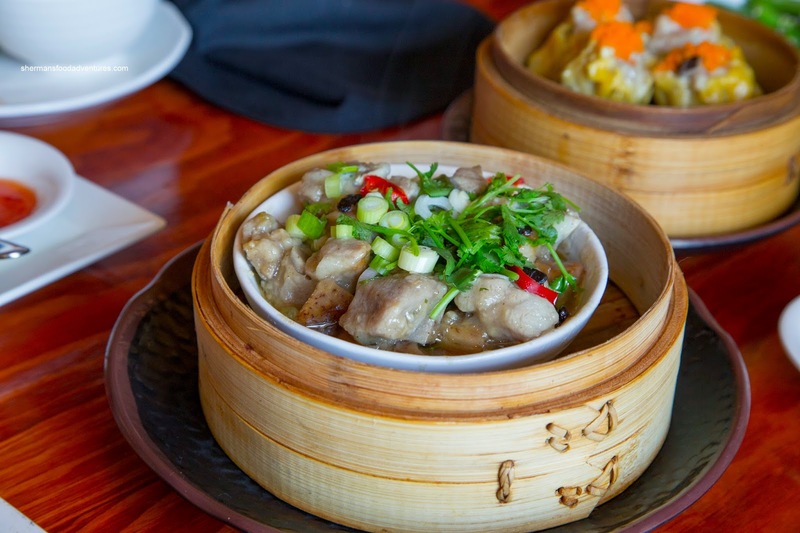 Yes, this one small plate would make up for lack of veggies in our diet... It was decent though with crunchy green beans that were coated with a starch-thicken seasoning that was somewhat garlicky. 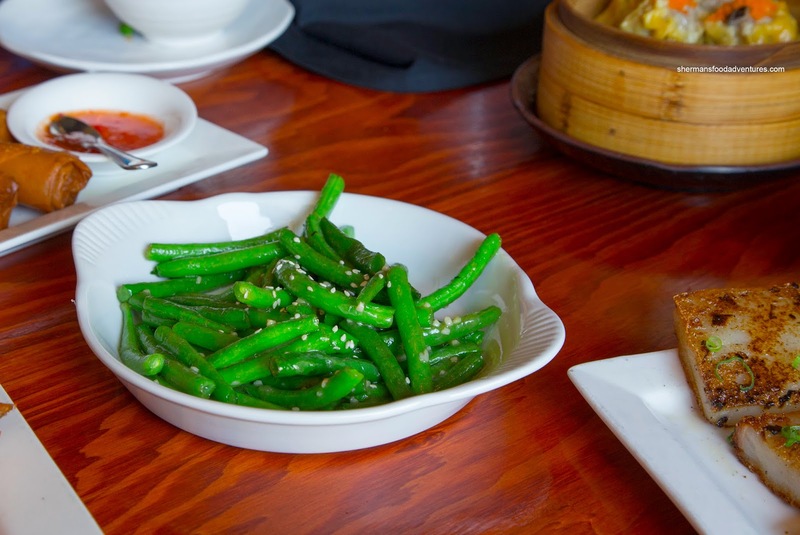 It appeared that they only lightly oil-blanched the green beans before wok-frying which meant they weren't shriveled up and overcooked. 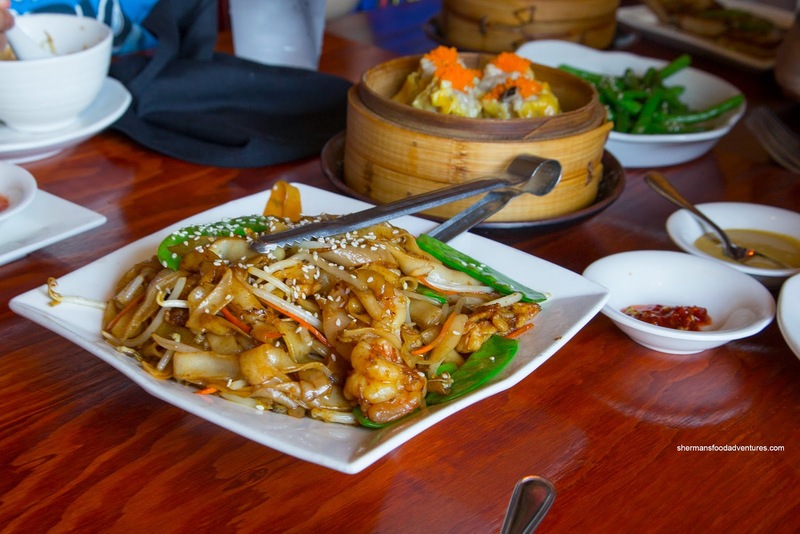 Since we got an order of fried rice, we thought of trying the House Chow Fun as well. The flat rice noodle were soft while keeping a certain chewiness. It wasn't as greasy as some other versions, yet still exhibiting good carmelization through proper wok heat. Again, much like the fried rice, the components were good including the large shrimp. 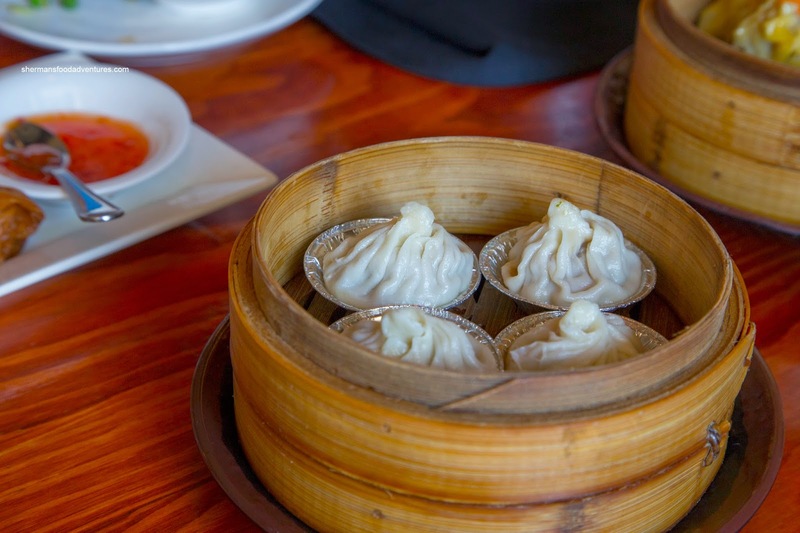 Steamed in little aluminum tart tins, the Xiao Long Bao were surprisingly acceptable. Generally, these turn out for the worse at Cantonese Dim Sum restaurants because they are specifically Shanghainese. 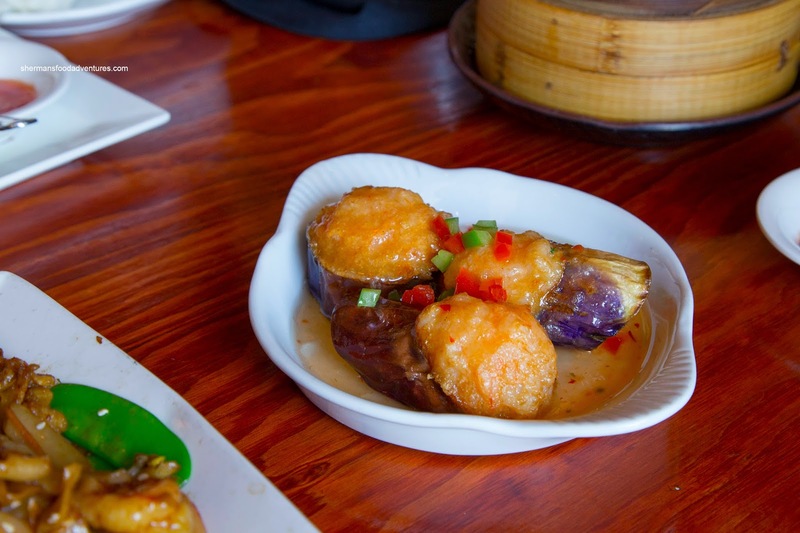 It featured a thin, chewy skin that revealed a soft and somewhat mushy filling that emanated xiao shing wine and a certain sweetness. However, there wasn't a whole lot of soup which was a shame since they were sitting in tins (no threat of spillage). Large, but flat, the Mushroom Dumplings suffered from an overly thick wrapper. It was somewhat dense and chewy, however, the woodsy mushroom filling was moist enough to make up for it. The filling wasn't particularly seasoned aggressively though, mainly relying on the mushroom's natural flavor. 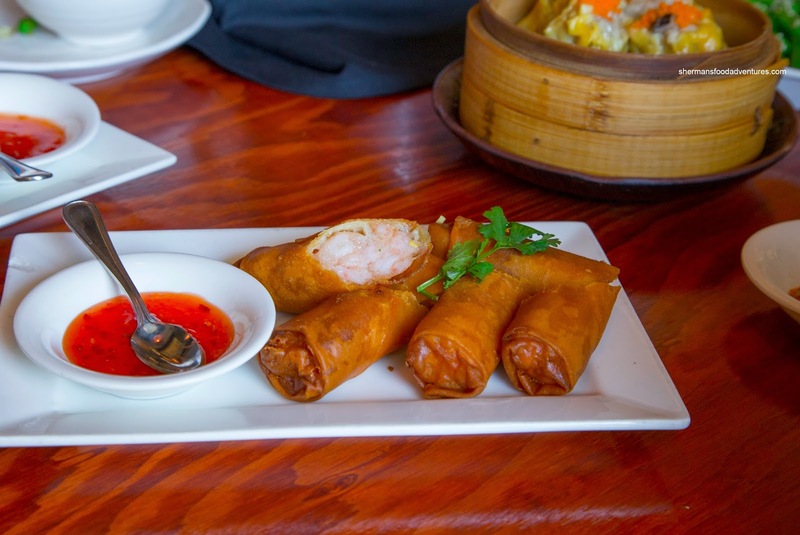 Moving along, we got 2 orders of the Shrimp Spring Rolls because my son could devour one plate himself. These arrived in a deep shade of golden brown where it was ultimately pretty greasy. Yet, that didn't affect the crispiness of the exterior. Inside, it was packed with shrimp that had a meaty snap. The shrimp was well-seasoned with a good balance of salty and sweetness. Continuing with the fried items, we tried the Shrimp Stuffed Eggplant next. With just the right thickness, the eggplant was nicely textured where it was fully cooked while not completely mushy either. The ample amount of shrimp mousse on top offered up a moist snap with a good balance of flavors. Interestingly, we couldn't figure out what type of sauce was on the plate. It didn't taste like much of anything. We kept going with the food in the Spareribs in Black Bean Sauce. Unlike the typical version, this was topped with green onions, cilantro and red peppers. Although they didn't ultimately affect the overall flavor profile much, it was a nice color contrast to the pale cooked pork color. The pork itself was chewy with a slight rebound while being peppery and garlicky. We didn't get a whole lot of black bean (not that salty), but there was a background spice. Also topped with greens, the Tofu Skin Roll with chicken and shrimp was a bit fishy tasting. Was it the shrimp? It wasn't unpleasant though as the the shrimp and chicken were sweet. Texturally, the filling was firm with some bounce. We liked the chewy skin, but it was quite greasy though. 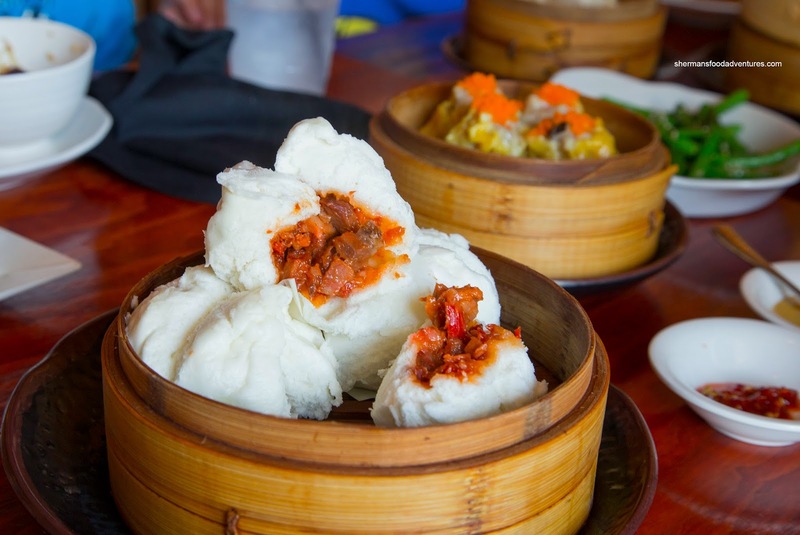 Lastly, we ended off with the Steamed BBQ Pork Buns. These were large and fluffy with a good amount of BBQ pork filling. It was not overly sweet and easy on the fatty pieces. If you were wondering if we ordered too much food, the answer would be *burp* yes. Therefore, our bill was pretty high as a result. Yet, the menu prices weren't cheap either. We didn't mind it too much as the food was pretty decent. 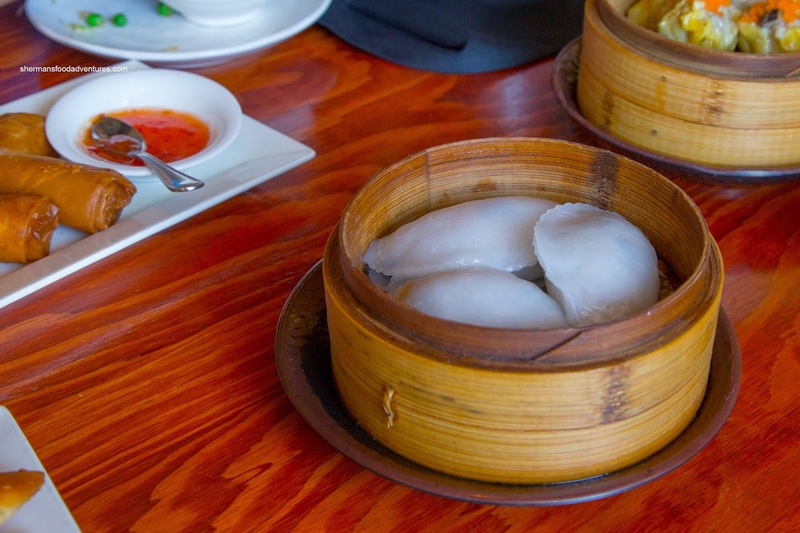 Although we've had better and for much cheaper (remember where they are located though), Bao did the job and quenched our thirst for Dim Sum.